India beat Australia by 137 runs in the third Test match at Melbourne to take a 2-1 lead in the four-match Test series. 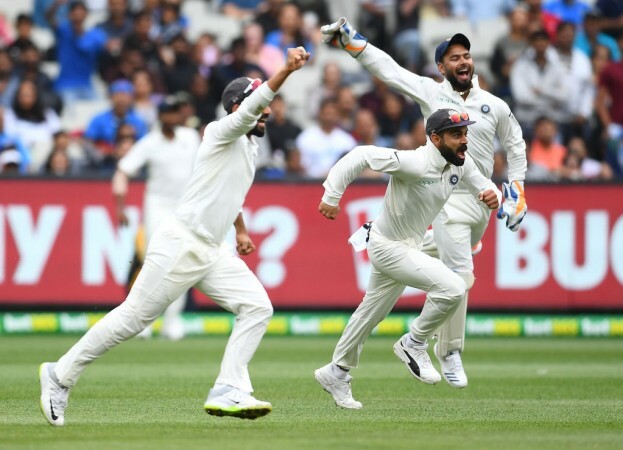 India has registered a historic victory at Melbourne in the third Test match against Australia to ensure they end 2018 with a 2-1 lead in the four-match series. India dominated the Test match from day 1 after skipper Virat Kohli won the toss and elected to bat first. The batting order, for once, stood up and made 443-7 in the first innings courtesy notable contributions from debutant Mayank Agarwal, Cheteshwar Pujara, Rohit Sharma and the captain himself. Following India's innings, there were a lot of talks regarding the pitch and how India's "slow batting" had cost them the Test match. But with ball in hand, Jasprit Bumrah almost single-handedly wrestled Australia out of the Test match as his 6-33 ensured Australia got no more than 151 in the first innings. India did not enforce the follow-on and Pat Cummins triggered a collapse but once again Mayank Agarwal stood tall and got able support from Rishabh Pant to ensure India set the hosts a target of 399. In the fourth innings, India once again struck early and all the bowlers got into the act to set up a memorable victory. But this victory did not come without a mini-scare as Cummins got stuck in and played a quite wonderful innings of 63. In fact, Kohli would have been worried when rain did not allow a single delivery to be bowled in the first session of the fifth day. But play eventually resumed after lunch and it was only a matter of time before India bundled Australia out to register a 137-run victory. The victory makes sure India will retain the Border-Gavaskar trophy and Twitter, naturally, went crazy. It's coming home, the border-gavaskar remains in India and poor Australian's can't do anything but swallow it.